When you're a Clintonite, you're a Clintonite all the way. 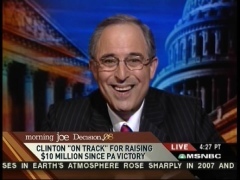 Look next to the definition of "Clinton loyalist" in the dictionary, and you're likely to find a photo of Lanny Davis. The man who would have put Baghdad Bob to shame for his unflinching flackery during Bill's Monica mess is back on the beat for Hillary. Yesterday, Davis wrote a HuffPo column purporting to set forth 10 Undisputed Facts showing Obama's weakness as a general election candidate against John Mccain. As Jake Tapper has observed, some of those "facts" are "both disputed and not facts," including the risible notion that Hillary didn't run any negative ads. Guess the commercial featuring Osama Bin Laden slipped Lanny's mind. Davis was back at it on today's Morning Joe. After repeating his claim from the HuffPo column that Obama is in a dead heat with McCain in super-blue in Massachusetts while Hillary's up by 15%, Davis took his anti-Obama argument a giant step further. Davis claimed that Barack is on track to lose in a blow-out of epic, McGovernesque, proportions. LANNY DAVIS: I feel badly for him and I have a great deal of respect for this man. DAVIS: My family members are [for] Barack Obama. SCARBOROUGH: Duck: here it comes! DAVIS: But there's a but. There's a but. He is still on the McGovern upper-income, liberal class, and he's got to break out of that or we could lose 49 states. SCARBOROUGH: You're talking like a Republican. This from a surrogate for the woman who claimed during the last debate that "yes, yes, yes" Obama could win. * 'Kafka' at TigerDroppings.com has pointed out that Stephen Sondheim wrote the West Side Story lyrics. Lenny composed the music. Who says LSU sports fans aren't Renaissance men?